New York is the definitive hub of contemporary art, and if like me you missed the opportunity to see The Tate Modern’s exhibition of Yayoi Kusama’s ‘Infinite Space’, the Whitney’s current show ‘Fireflies on the Water’ comes highly recommended. So much so, that if you arrive at the gallery after midday you’re almost guaranteed to miss out on seeing the piece, due to the high demand for tickets. The piece is on display until October 28th, and every individual that views it must enter the space alone. For one timed minute, you’re able to experience Kusama’s inner-most thoughts. To understand the context of the piece, I’d recommend taking a look around the rest of the exhibit prior to entering. Her artistic history is somewhat ‘colourful’. Having experimented with sculpture, textiles, photography, painting and currently – light installations, Kusama is well versed in a plethora of media. 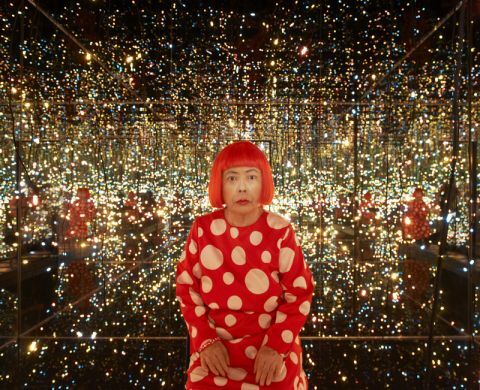 Kusama has voluntarily lived in a psychiatric ward since 1977 and her work certainly reflects this aspect of her mental fatigue. Her obsession with polka dots, abstracted shafts of colour and photo collage are prevalent throughout her career and ‘Fireflies’ acts almost as a conclusive element to her retrospective, particularly as it is contained separately to her previous works, in a space on the ground level of the building. Disappointingly, the way the piece is organised is a little lack-lustre. Queuing around the circumference of a white space, whilst an invigilator times the entrants’ in the exhibit removes some of the excitement. Nonetheless, the short time spent within the exhibition is extraordinary. Upon entering the space, individuals can walk three feet down a wooden platform surrounded by shallow water. Mirrors reflect the multitude of hanging lights around the space, creating a 360° infinite reflective environment. The space is disorientating, almost hallucinogenic, but the sound of the vacant flow of wind over a low hum of voices is womb-like and comforting. Gazing into the endless reflection is comparable to an out of body experience, but instead of feeling displaced – and as with many of the photographs that document her work – Yayoi makes you a vital part of the piece. Succinctly allowing the viewer to experience her mind set, it’s easy to get lost in the colours and lights. Standing on the parapet, the room goes on forever and a definite sense of mental instability is encapsulated. But as with an unstable mental state, it’s so easy to snap back to reality when, looking around, the size of the room is suddenly apparent. The shallow water is just a mirage; the frames that hold the mirrors are visible, the floor tacky from the cheap non-slip linoleum on the platform and the illuminated, suspended chains not dissimilar from store-bought Christmas lights. Nonetheless, once the door reopens and you’re hurried out of the exhibit, it’s apparent how mesmerising the piece is. Watching other people exiting, I was struck by the amount of adults and children who left the exhibition smiling. Yayoi Kusama’s intention is to create an immersive piece which allows the viewer to experience her creative process and inspiration – her thoughts. Being able to encounter her work individually allows you to form a relationship with the artist, giving the work a sense of sincerety and honesty. She presents the piece generously; however personal her work is, she is able to create an environment which is not prescriptive. I'm currently studying in my second year of Fine Art at Nottingham Trent university. I'm really lucky to be living in such a diverse and rich art envorinment and am looking forward to completing my degree in the city!